I have to thank Germ Guy for providing me with yet another enlightening -- and entertaining -- illustration of the intellectual bankruptcy that pervades the public discourse when it comes to the question of vaccines. Yesterday, I published the first installment of a multi-part exposé demonstrating how the media systematically lie to the public about what science says about the safety and effectiveness of vaccines. It examines the case study of a recent New York Times propaganda piece urging us all to line up obediently for an annual flu shot. I naturally expect to get flak for writing that. But the first I received on Twitter is just too funny, and helps to illustrate the point I was making about the deep intellectual dishonesty that is so pervasive when it comes to this issue. 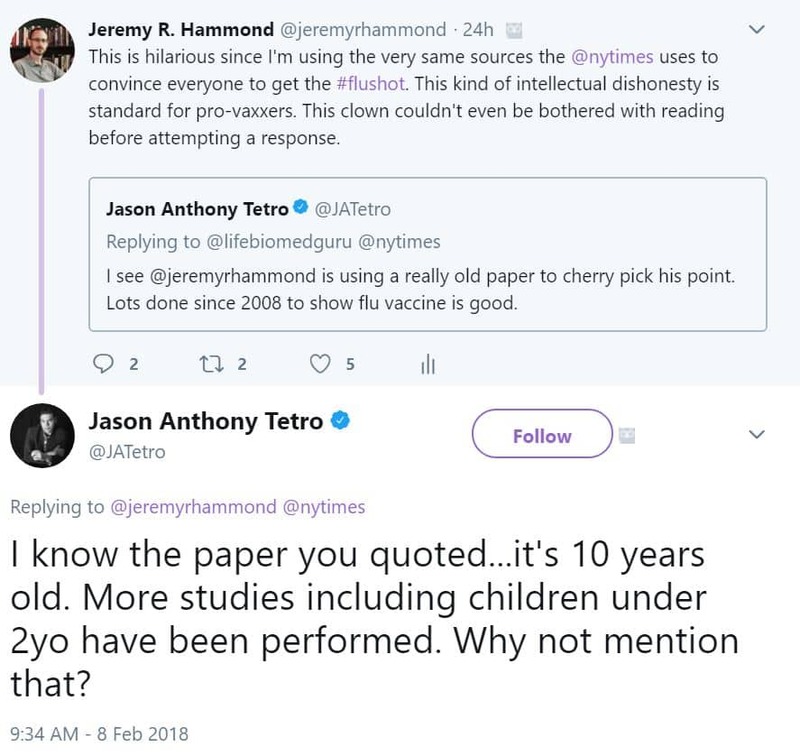 So here is Jason Anthony Tetro, “The Germ Guy”, who is author of The Germ Code and The Germ Files, accusing me of intellectual dishonesty. Because I quoted from a study in the medical literature that is “really old”. The one he evidently means was published in 2010, to be precise (actually, I cited eight studies from the medical literature, as well as numerous CDC webpages and Merck’s “Fluarix” influenza vaccine package insert, but this is the one he seems to mean). As you might have been able to deduce from Germ Guy’s tweet, the study I cited didn’t exactly lavish glowing praise on the CDC’s recommendation of using the influenza vaccine as a universal publish health measure. But here’s what’s so funny about this vain criticism: Germ Guy completely ignores the whole reason why I chose to cite that “really old” study. I’ll give it to you in screenshots. And that is what Germ Guy is criticizing me for in his tweet! He is accusing me of intellectual dishonesty because I cited a “very old” study to show what it actually said as compared to how the New York Times had grossly mischaracterized it. Now think about the standard being employed by Germ Guy here. Note that he doesn’t criticize the New York Times for demonstrably deceiving readers about the science. No, instead, he literally is criticizing me just for quoting a study to show how the Times was misrepresenting it! And I’m the one “cherry-picking”? LOL! Evidently, one must never quote a study if the purpose is to inform the public of the truth. No, one may cite “very old” studies only if the purpose is to persuade people to vaccinate! Of course, again, the age of the study is irrelevant to the point. Whether a study is 20 years old, 10 years old, or published yesterday, the media should accurately relate to the public what the literature says. But we’re not done with our friend Germ Guy yet. This is just too good. So what is he referring to here? What is his criticism? Oh, but there I go again quoting from an “old” study! How intellectually dishonest of me, right?! 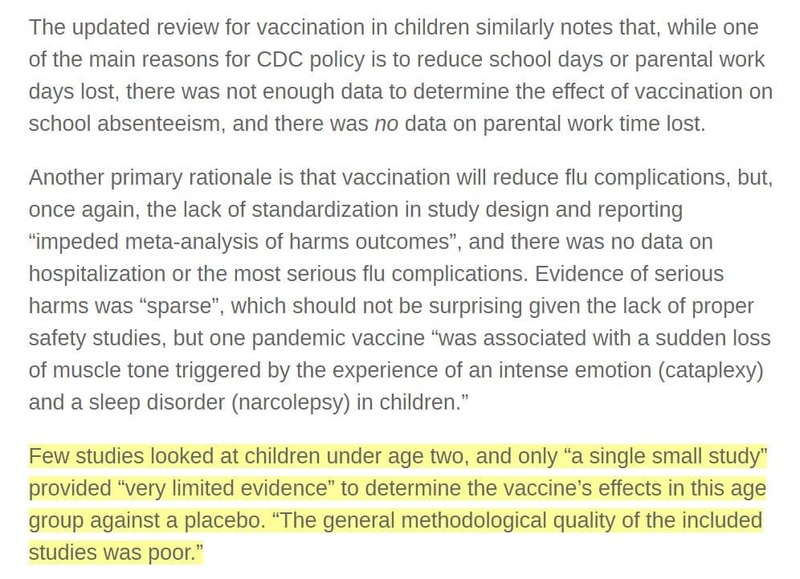 So note what Germ Guy’s still trying to do here: he’s still trying to accuse me of being intellectually dishonest on the grounds I cited the 2012 study, which concluded that no proper safety studies had been done for children under two years of age, even though the CDC recommends the flu vaccine for infants as young as six months. Once again, of course, the age of this Cochrane review is irrelevant to the point, which is that the Times is being recklessly irresponsible in deceiving its readers. But more evidence has come out since then, Germ Guy is claiming, vindicating public policy. So why haven’t I mentioned more recent studies?! Too funny! The question we really need to ask here is: Why didn’t Germ Guy mention that he evidently couldn’t be bothered to actually read my article before attempting to tweet a rebuttal to it?! Why doesn’t Germ Guy mention the fact that I include a whole section in the paper summarizing key findings from the most recent Cochrane meta-analyses for the influenza vaccine, literally just published 8 days ago?! And this guy is accusing me of intellectual dishonesty! So there you have it. 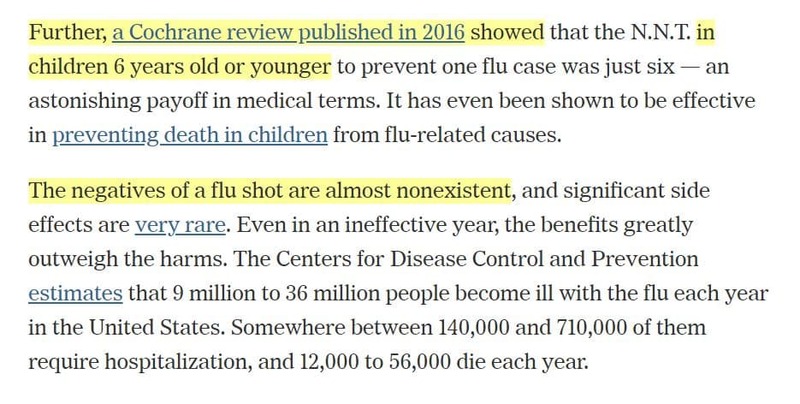 I encourage you to do what the New York Times obviously was expecting readers not to do and check the sources for yourself, to see what the science really has to say. In concluding, I have to thank Germ Guy for providing me with yet another enlightening — and entertaining — illustration of the intellectual bankruptcy that pervades the public discourse when it comes to the question of vaccines. My grievous sin was to commit the crime of heresy against the vaccine religion. Click here to read part one of my flu vaccine exposé! Also be sure to follow me on Twitter.